At Baker Street 221B you can find the Sherlock Holmes Museum. You first buy the ticket at Mrs. Hudson Shop and then wait in the queue. The Museum tries its best to show how was life on Victorian's years and reproduce some of the artifacts that shows on Holmes' tales, such as letters, newspapers books and cases's evidences. By the top of the house you can find statues reproducing moments of the stories. 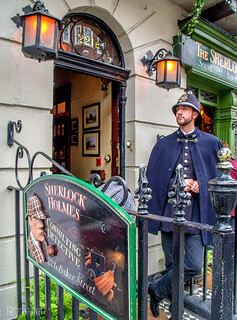 The museum shows the 221B Baker Street as it is described on the books.